Troymet’s Joint Venture Partner P… | Troymet Exploration Corp.
December 15, 2015 - Troymet Exploration Corp. (TSXV:TYE) (“Troymet” or the “ Company”) is pleased to update progress on its McClarty Lake VMS project, in Manitoba. 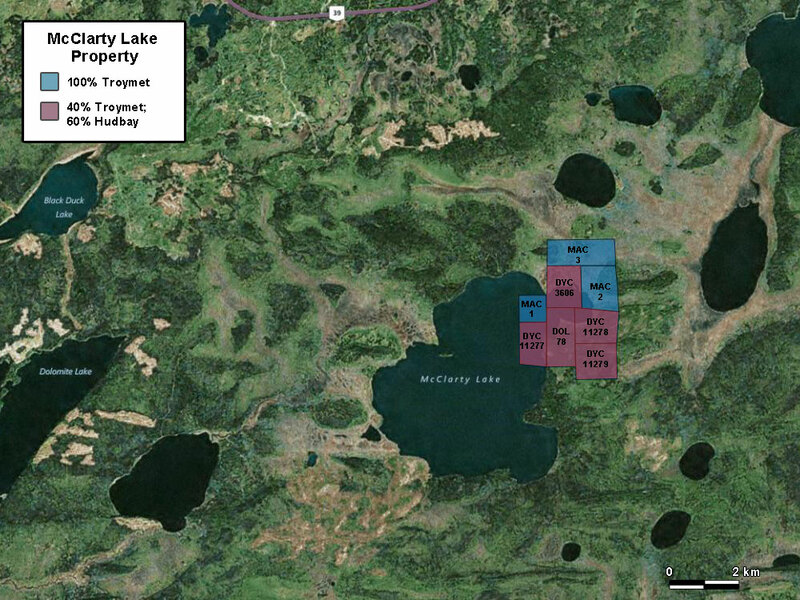 The McClarty Lake property is located 47 kilometres southwest of Snow Lake, MB and comprises eight contiguous mineral claims totaling 936 hectares. Troymet owns 100% interest in three of the claims (344 hectares) and a 40% interest in five claims (588 hectares) in a Joint Venture with Hudbay Minerals Inc. (“ Hudbay”). Under the terms of the Joint Venture Agreement, Hudbay must contribute $1,151,052 in joint venture expenditures before Troymet is required to fund its participating interest. In early 2015, Hudbay, as Joint Venture operator, completed a compilation and review of all the technical data for the Joint Venture claims (news release dated March 19, 2015). This work resulted in the identification of new targets and the subsequent staking, by the Joint Venture, of three new mineral claims which are now included in the Joint Venture (see McClartyLake Claim Map). Two of the newly identified targets occur near the boundary between Joint Venture claims and 100% owned Troymet claims. Hudbay planned to conduct ground geophysical surveys over the newly identified exploration targets in Spring 2015, however, the work had to be deferred due to poor ice conditions. Troymet has been advised by Hudbay that Hudbay still plans to conduct the ground geophysical surveys once ice conditions permit. Kieran Downes, P.Geo., a Qualified Person as defined by National Instrument 43-101, has reviewed and verified the technical information provided in this release. Troymet will be presenting data for its projects at the Vancouver Resources Investment Conference which will be held from January 24-25, 2016 at the Vancouver Convention Centre West, Booth #531. This news release may contain certain forward-looking information. All statements included herein, other than statements of historical fact, are forward-looking information and such information involves various risks and uncertainties. In particular, this news release contains forward-looking information in respect of: potential future expenditures by Hudbay on the Joint Venture; and future potential exploration surveys undertaken by Hudbay on the Joint Venture. There can be no assurance that such information will prove to be accurate, and actual results and future events could differ materially from those anticipated in such information. This forward-looking information reflects Troymet’s current beliefs and is based on information currently available to Troymet and on assumptions Troymet believes are reasonable. These assumptions include, but are not limited to: Troymet’s current and initial understanding and analysis of the McClarty Project and the new exploration targets; Hudbay’s continuing management approval to explore the Joint Venture; and Hudbay’s exploration costs of the Joint Venture being consistent with past exploration costs incurred by Hudbay and Troymet on the Joint Venture. Forward-looking information is subject to known and unknown risks, uncertainties and other factors which may cause the actual results, level of activity, performance or achievements of Troymet to be materially different from those expressed or implied by such forward-looking information. Such risks and other factors may include, but are not limited to: the early stage development of Troymet and its projects; general business, economic, competitive, political and social uncertainties; capital market conditions and market prices for securities, junior market securities and mining exploration company securities; commodity prices; the actual results of current exploration and development or operational activities; competition; changes in project parameters as plans continue to be refined; accidents and other risks inherent in the mining industry; lack of insurance; delay or failure to receive board or regulatory approvals; changes in legislation, including environmental legislation, affecting Troymet; timing and availability of external financing on acceptable terms; conclusions of economic evaluations; and lack of qualified, skilled labour or loss of key individuals. A description of other assumptions used to develop such forward-looking information and a description of other risk factors that may cause actual results to differ materially from forward-looking information can be found in Troymet’s disclosure documents on the SEDAR website at www.sedar.com. Troymet does not undertake to update any forward-looking information except in accordance with applicable securities laws.